If last month's SLS Baha Mar was "the über-cool new kid on the Nassau block", then this episode's Hope Town Harbour Lodge is your stylish, off-the-grid Aunt that you visit when you want to unwind and recharge. Welcome back to the Cacique Resort Review, in which we offer you a snapshot of our exceptional partner resorts around the beautiful islands of The Bahamas. In this episode, we are whisking you away to Hope Town Harbour Lodge (HHL) - a quaint escape on Elbow Cay in the fabled Abacos - a chain of tropical islands and "loyalist cays" renown for their natural beauty and history. HOPE TOWN HARBOUR LODGE | THE WHY? We asked HHL why guests migrate to the charming lodge hideaway. The simple answer,"The harbour lodge is truly an escape from the real world." Flanked by the iconic Hopetown Harbour on one side and 2 miles of stunning Atlantic beach on the other, HHL is the perfect retreat from the hectic pace of the modern world. With the quaint olde-worlde township just a short meander away, "hectic" here could be defined as a line of golf carts, waiting for the freshly-baked delights of one of the Hope Town bakeries. With rooms, cottages and cabanas to fulfill any beachside fantasy, idyllic tucked-away spaces and white-sand beaches, HHL is the perfect venue for intimate groups, executive retreats, receptions, dinners and weddings. HOPE TOWN HARBOUR LODGE | THE WHAT? Relax. Recharge. Relax some more. With miles of surf-swept beaches, colourful reefs, and a charming historic landscape, HHL provides an enchanting backdrop for team building, creative ideation sessions, corporate retreats and bespoke group activities. The iconic, candy-striped Elbow Reef lighthouse is a must-see, as it is the only hand-wound kerosene lighthouse left in the world. Transportation on the island is easy-going and comes in the fun-sized form of bicycles and golf carts. For true explorers, a boat charter is the best way to hop over to neighboring cays or get out beyond the reef for some Hemmingwayesque sportsfishing. HOPE TOWN HARBOUR LODGE | THE WHEN? Our archipelago of over 700 islands is blessed with a warm, agreeable climate that varies little year-round. The peak tourism season for "The Loyalist Cays" is mid-April through mid-August with highs of 90°F and lows at a balmy 81°F - perfect for outdoor dining and night-time jaunts along the beach. 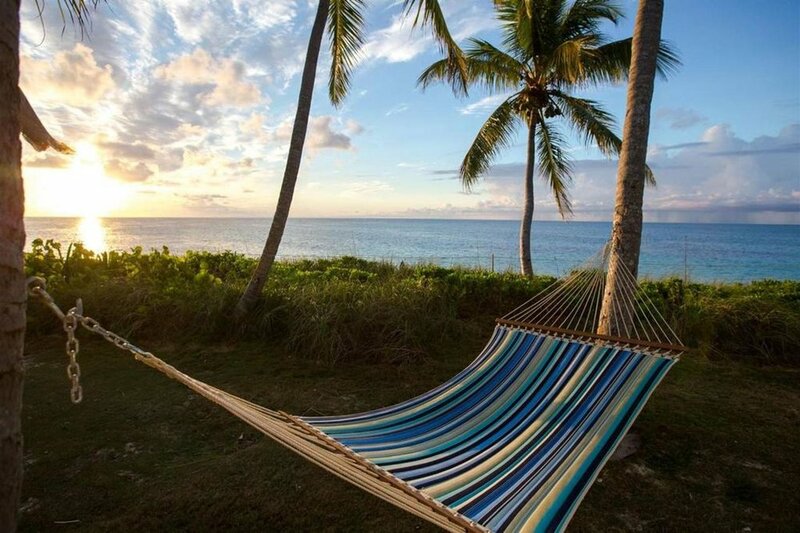 Outside of these months, The Bahamas enjoys a perennially warm and inviting climate. June through early November is hurricane season, so best to keep an eye on the forecasts and give yourself options. HOPE TOWN HARBOUR LODGE | THE HOW? Travelling to Hope Town Harbour Lodge is a simple and delightful journey, with Team Cacique taking care of you every step of the way. Touch down at Nassau's Lynden Pindling International Airport, hop over to Abaco (20min. flight) and skip (10min. boat ride) across the azure waters from Marsh Harbour to Hopetown, Elbow Cay. Once the ferry has set sail, the only thing left to do is to be welcomed by the warm embrace of your stylish, off-the-grid Aunt!